Our nunchuck swivel floggers are designed with fast action and fluid motion in mind. The nunchuck handles have a ball-bearing swivel, and the falls are attached to a swivel clip which allows them to be detached and interchanged. 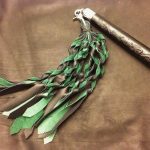 These floggers work beautifully in pairs for two handed, rhythmic and Florentine work. Please note – all the listings on this page are for single floggers, not pairs. 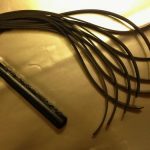 Many styles have optional finger loops that allow them to be easily converted into finger poi floggers.